We decided that this is a prime time to start our food storage. I mean with $1 boxes of cereal how could we pass it up?? Geri almost had a break down as I filled cart #1 and started on #2. She's always had a complex about what she calls "yearly shoppers" (people who load up not only 1 cart but several with embarrassing items like toilet paper...) Well we just became yearly shoppers with our cereal and juice! Way to go guys! Now you'll just have to buy a lot of milk or get a cow. I'm in shock... where are you storing 50 boxes of cereal and all that juice? Can you eat 50 boxes of cereal before they expire? Good job and GOOD LUCK!! HAAAAA I wish I was shopping the same isle as you! I would have loved to see the skinny kid HOARDING the cereal! 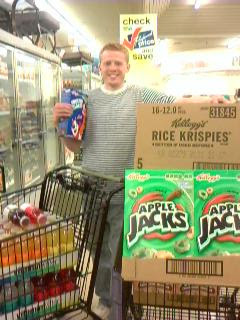 I know where we are headed when times get tough for some good ol' apple jacks! Man I am bummed I missed that SALE! I bet you guys are pumped. I just hope I don't get apple jacks or vitamin water for Christmas this year!! Geri when you used to bring boxes of cereal to class I never would have imagined it would eventually come to this! WOW! You could have just made it to the top of the list for favorite Aunt & Uncle when my kids see this! Jason, good on ya for posting. Proud of ya. Can your wife move to my house? She may have to sleep outside on the tramp this summer, but that's pretty fun sometimes. Then maybe the wild punks would actually behave :). haha!! 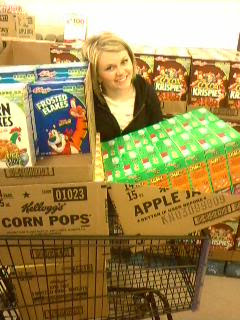 I need 50 boxes of cereal!! way to be the example guys!